The hills and mountains of of Galicia in north-west Spain are covered in heather and gorse which flower from late summer into autumn. 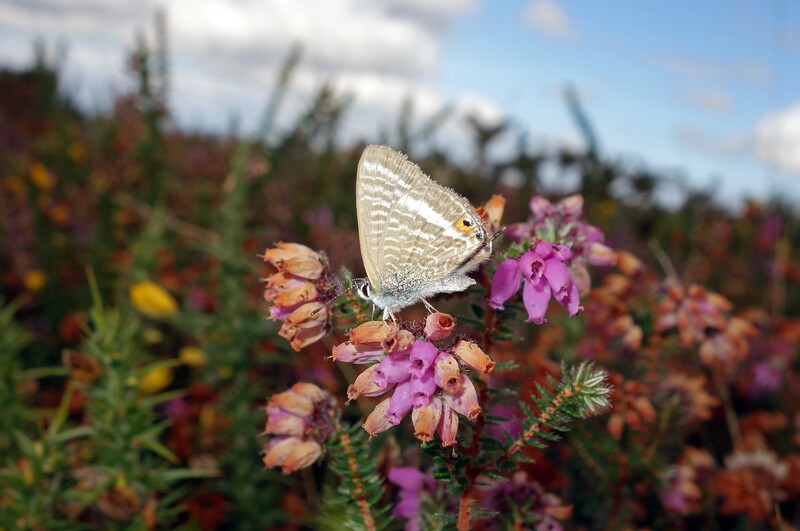 The heather and gorse are alive with insects (and spiders!) including an array of small blues. 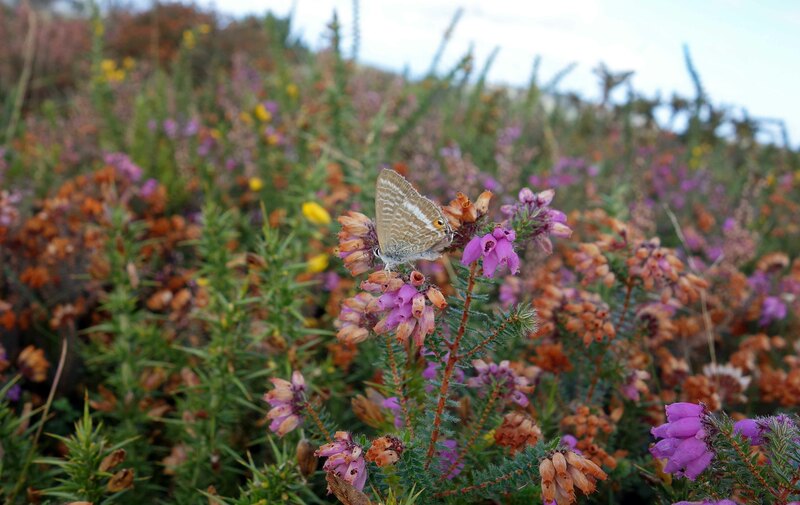 When I visited Galicia in early October, the heather was still flowering and butterflies were still flying. Despite being late in the year, there were still lots of small blues (Lycaenidae) flying around in the sunshine, including the Long-tailed blue (Lampides boeticus), seen below. Surprisingly enough, the Long-tailed blue (Lampides boeticus) is one of the most widely distributed species of butterfly in the world, since in occurs on four continents and ranges across most of the so-called Old World (1). It has even been found in southern England on rare occasions! It is also called the Pea Blue. The males have the attractive violet-blue wings, whilst the females are a more brownish colour (but equally attractive!). These butterflies are very stong fliers, which accounts for the very wide distribution of this species, which even managed to colonise New Zealand in 1965. It was however, considered to be a natural colonisation, so it did not get tarred with the brush of being an invasive species! Just a very flighty one. 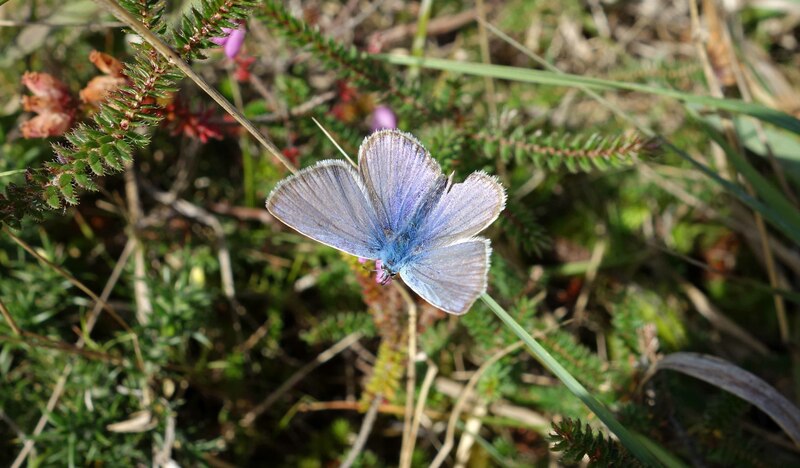 Another little blue which was also very common up on the delightful heather and gorse-covered hills above Ortigueira in Galicia, was Lang’s Short-tailed blue (Leptotes pirithous). Incidentally, it is hard to tell whether the so-called tails are short or long, as they get worn down, so these are not very useful names in my opinion! 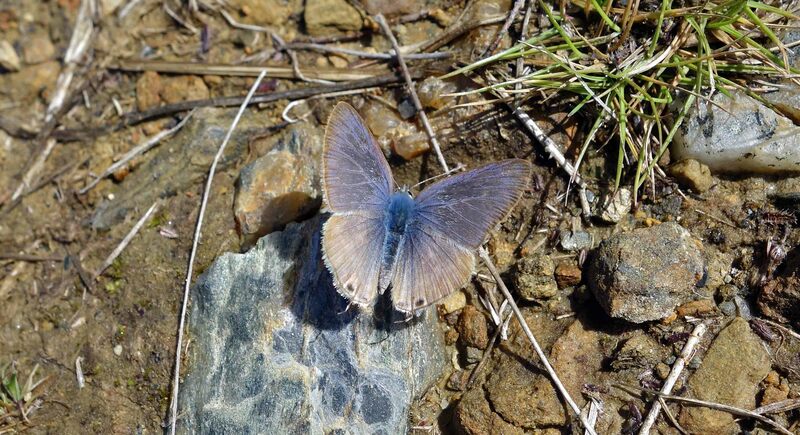 Leptotes pirithous is also a very widely distributed species, with a Pan-African distribution extends north into most Mediterranean countries (2). It is another stongly migratory species and has recently spread to the Canary Islands (3). One individual was even found in the UK in 1938! Probably blown off course on their way to the Canary Islands! 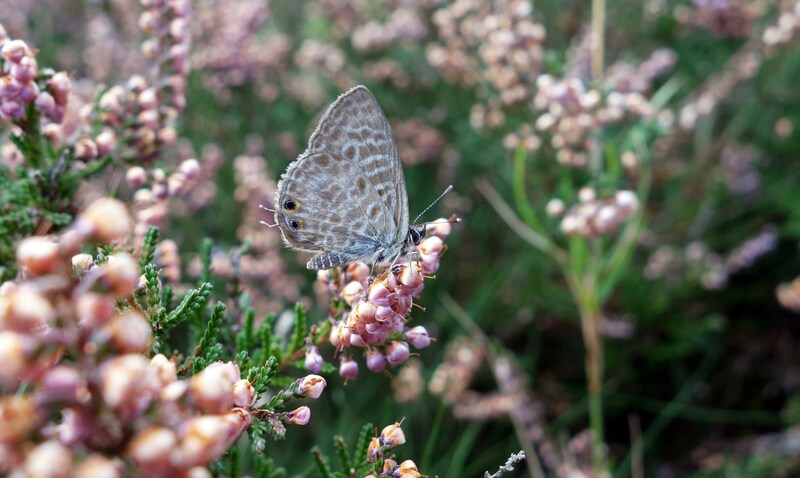 As with the Long-tailed blue, Lang’s Short-tailed blue also has males with purplish-blue wings (upperside) and females with bluish-brown wings (upperside). This sexual dimorphism may be to do with mating or territorial displays. 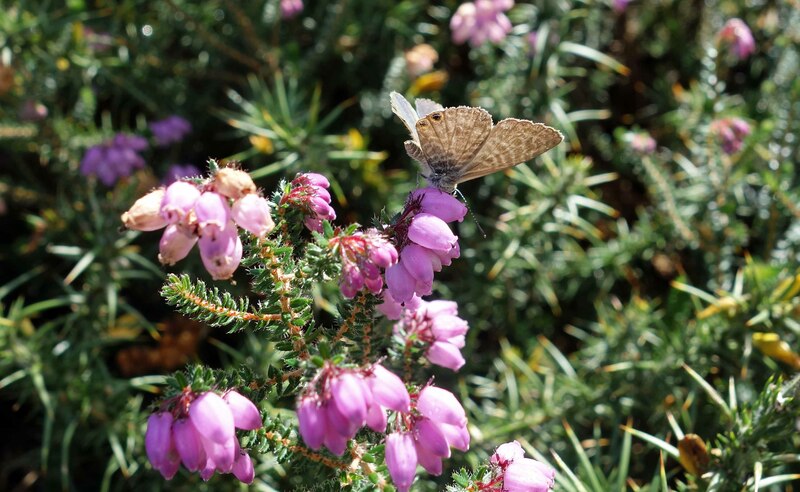 The blue wings of lycaenid butterflies are highly reflective of ultra violet light, and the males may be using their wings to display to females or to let other males know that this is their patch! 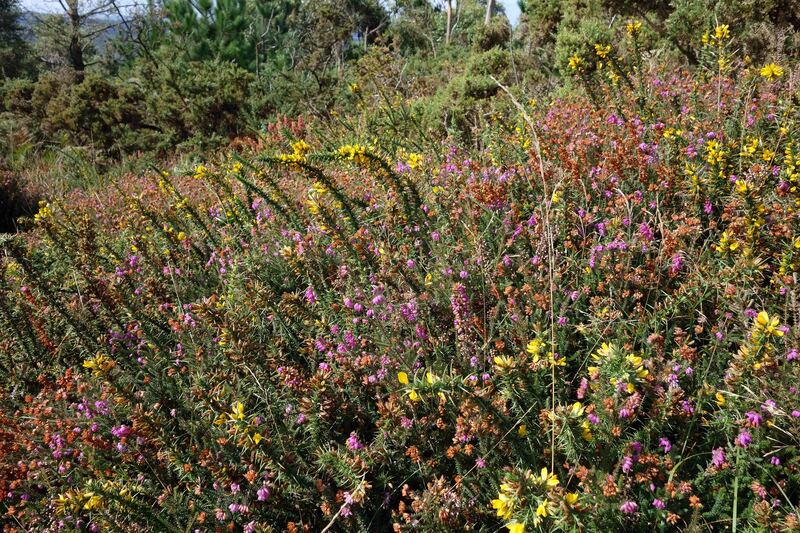 The ‘patches’ themselves were highly attractive the my human eye, and it is hard to think of a more aesthetically pleasing habitat than this, with small blue butterflies flitting about the pink and mauve bell heathers, and the yellow gorse flowers. It is amazing how long the heather flowers for, from August to October. 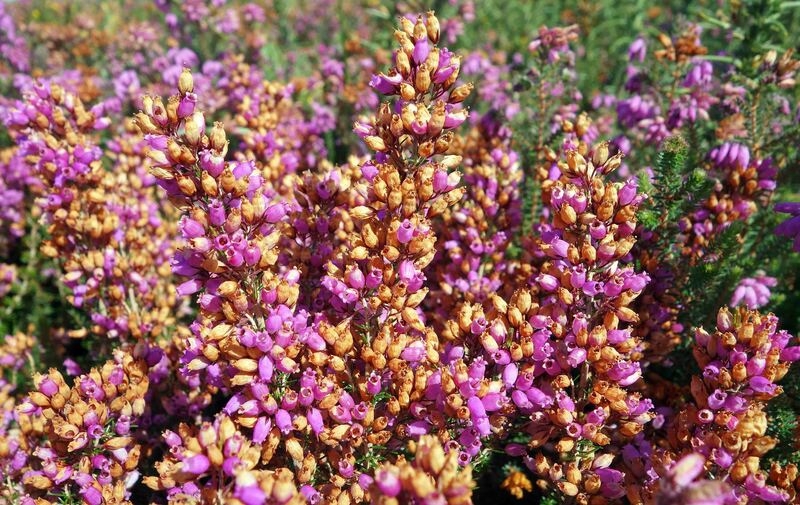 A close look at the heather (see below) shows that some of the little flowers had died, but many others continue to bloom, thus providing the nectar-feeding bees and butterflies with a continual source of food. Heather showing some flowers in bloom and others having died. There were large numbers of bumblebees in the heather, but that will have to be the topic of a future blog (and some are very hard to photograph!). 1) Lohman, David J., et al. “Phylogeography and genetic diversity of a widespread Old World butterfly, Lampides boeticus (Lepidoptera: Lycaenidae).” BMC evolutionary biology 8.1 (2008): 301. http://www.biomedcentral.com/1471-2148/8/301. 2) KUDRNA, O., HARPKE, A., LUX, K., PENNERSTORFER, J., SCHWEIGER, O., SETTELE, J. & WIEMERS, M., 2011.– Distribution Atlas of Butterflies in Europe: 576 pp. 3) Wiemers, M., B. Acosta-Fernández, and T. B. Larsen. 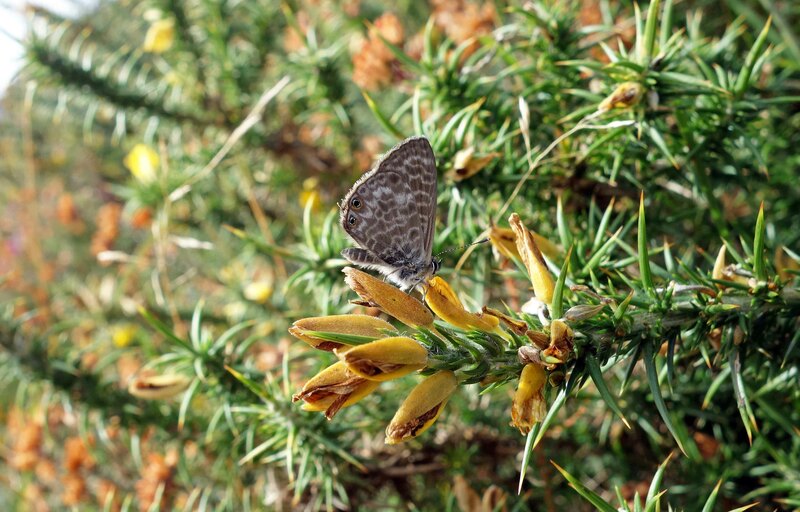 “On the recent invasion of the Canary Islands by two butterfly species, with the first record of Leptotes pirithous (Linnaeus, 1767) from Gran Canaria, Spain (Lepidoptera: Lycaenidae).” SHILAP Revista de Lepidopterología 41.161 (2013): 95-104. Previous Previous post: A comma, not a full stop! Ray Cannon's nature notes Blues on the heath!